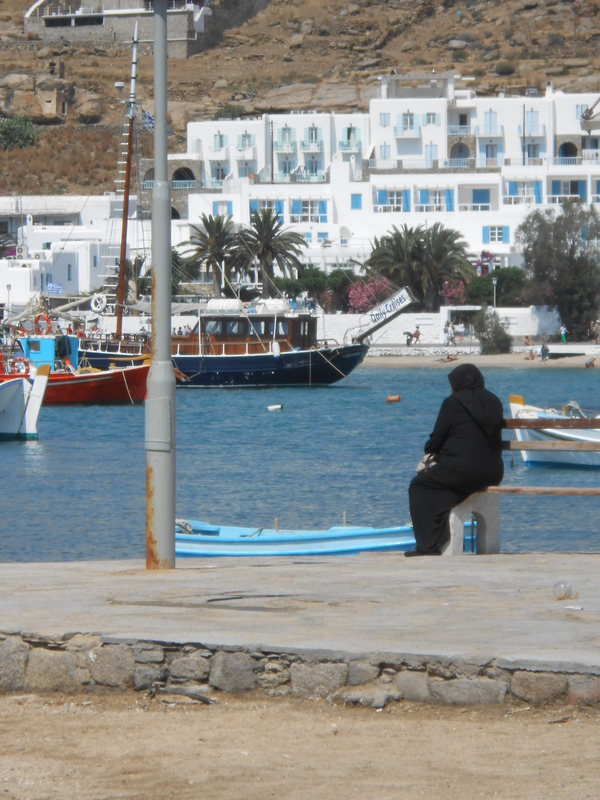 Across from the café sat a woman all dressed in black sharing our view. 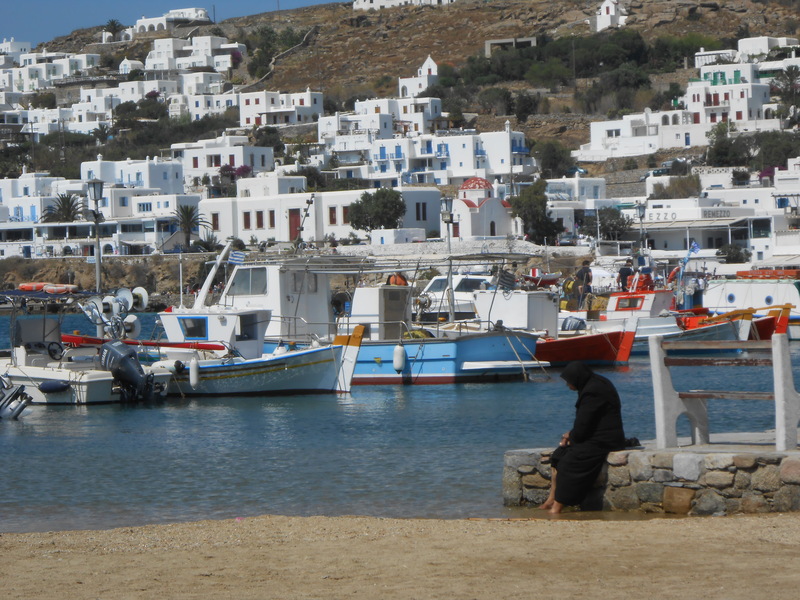 The woman in black sat in the same spot for almost an hour, then she stood up, took off her shoes, and dabbled her feet in the cool, clear water, giving us the opportunity for an extra interesting photo. Two of my favorite photos of Venice enhanced by gulls that flew into the setting. 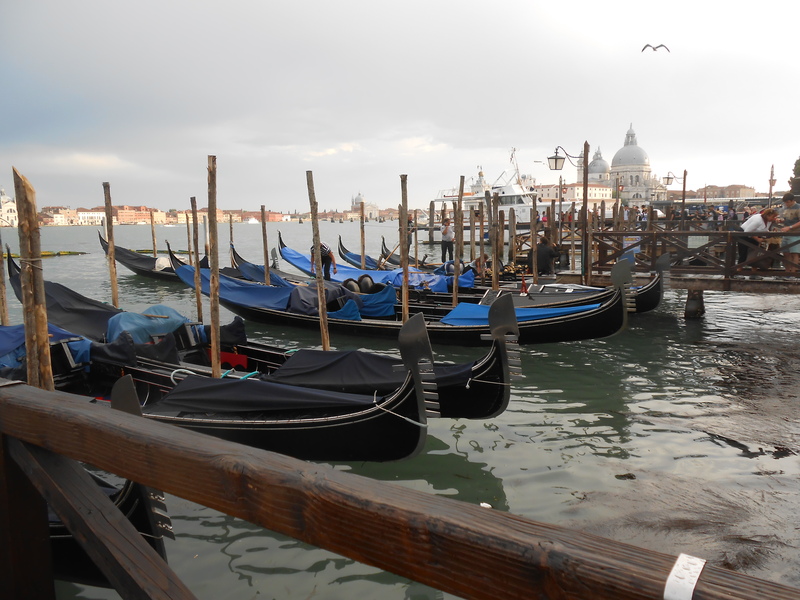 The rain kept the gondolas docked for a short time, but as soon as the sun came back out, excited tourists climbed in for tours of the canals. 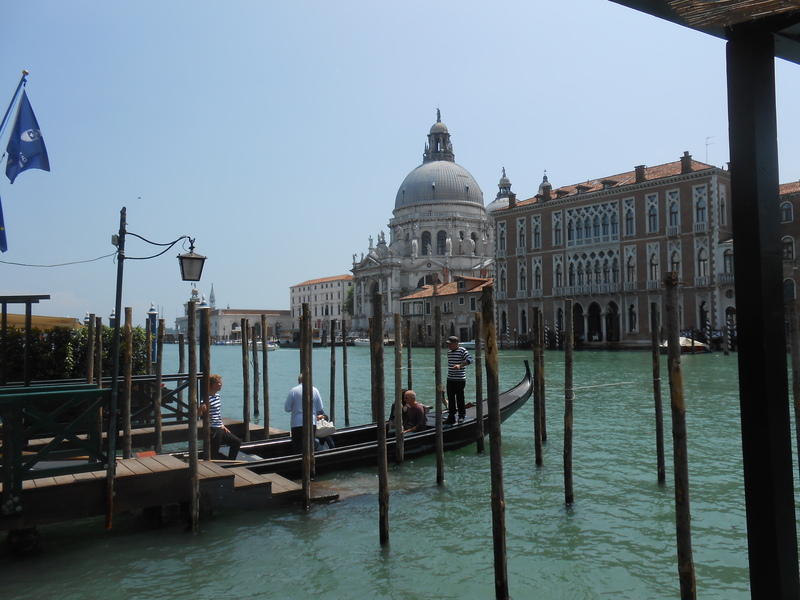 On May 28th, My friend Connie and I flew into Aeroporto di Venezia Marco Polo, Venice, Italy on a direct USAir flight from Philadelphia, arriving early in the morning on May 29th. 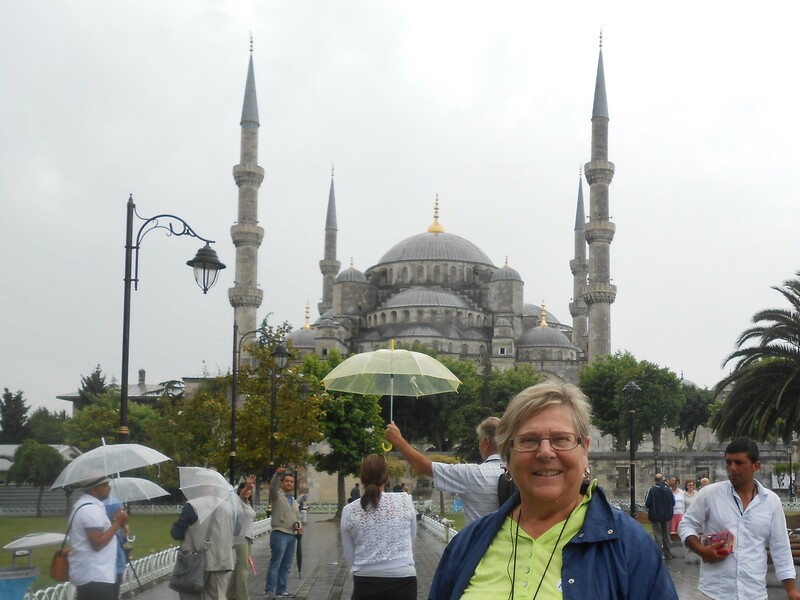 We planned to join a cruise ship the next day, so we had only thirty hours in this glorious city. 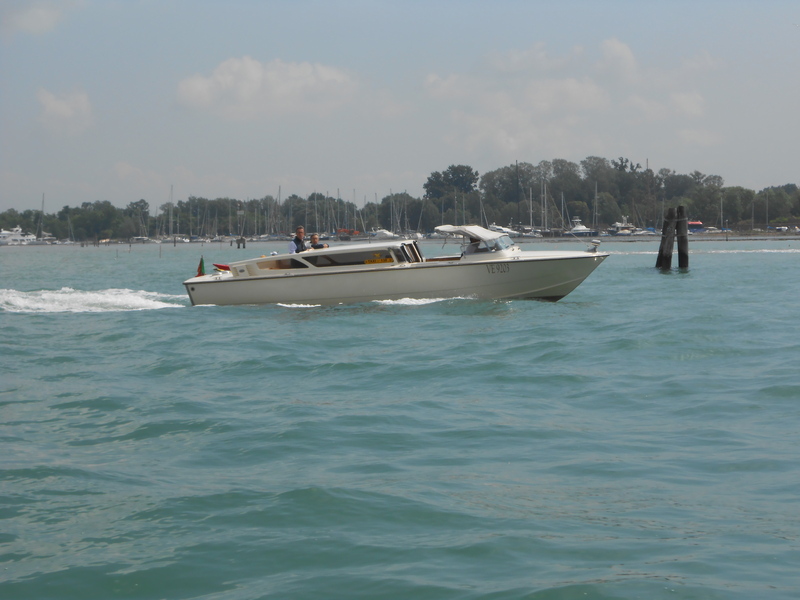 The Marco Polo Airport, located on the Italian mainland, is a relatively short distance from Venice. 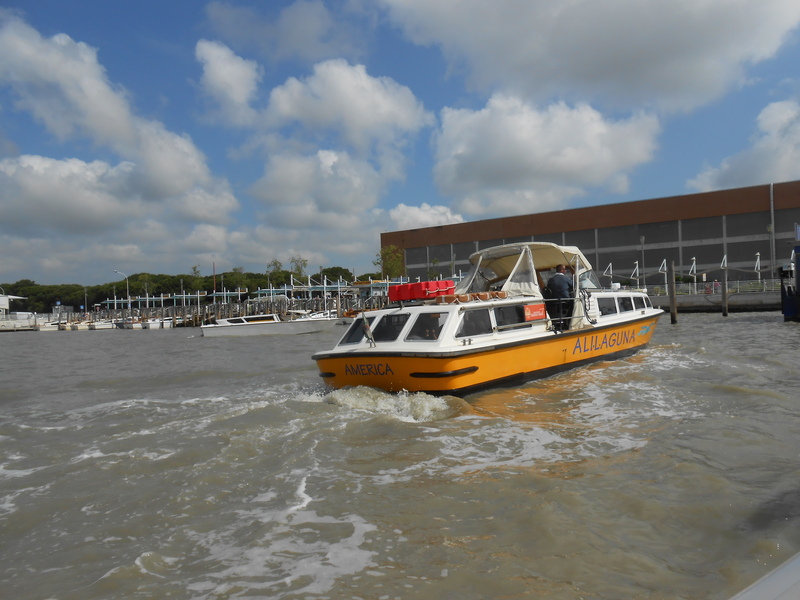 We had several options for going from the airport to Venice: by land (airport bus or taxi) or by sea (water bus or water taxi). We chose the reasonably priced (15 euro = about $20 US) Alilaguna Blue water bus for the hour-long trip to San Marco Piazza (St. Mark’s Square). (Buy tickets inside the airport terminal and walk outside around the building to the docks…a five-minute walk.) We took this same Alilaguna Blue line from San Marco Piazza water stop out to the cruise terminal on May 30th for 8 euro (about $10 US). The weather was remarkably pleasant: warm and sunny with partly cloudy skies. 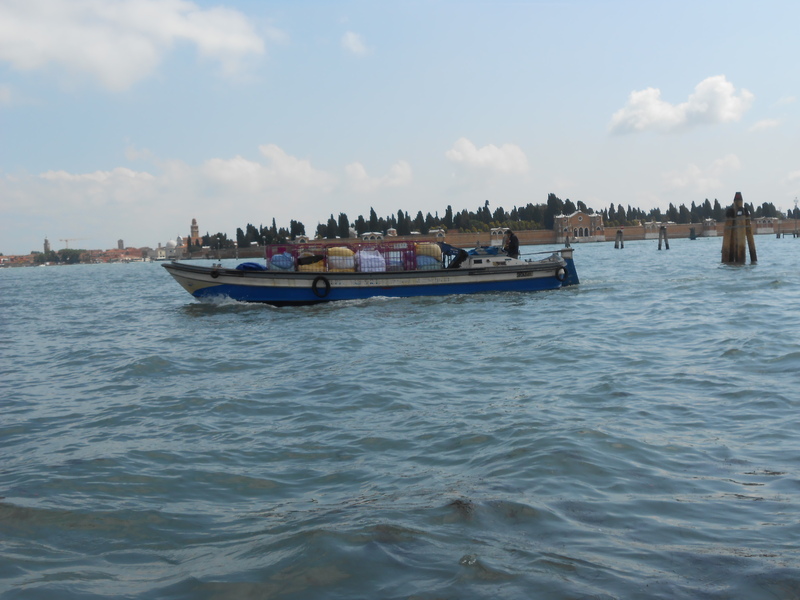 Other visitors joined us on the uncrowded and comfortable ride to Venice. 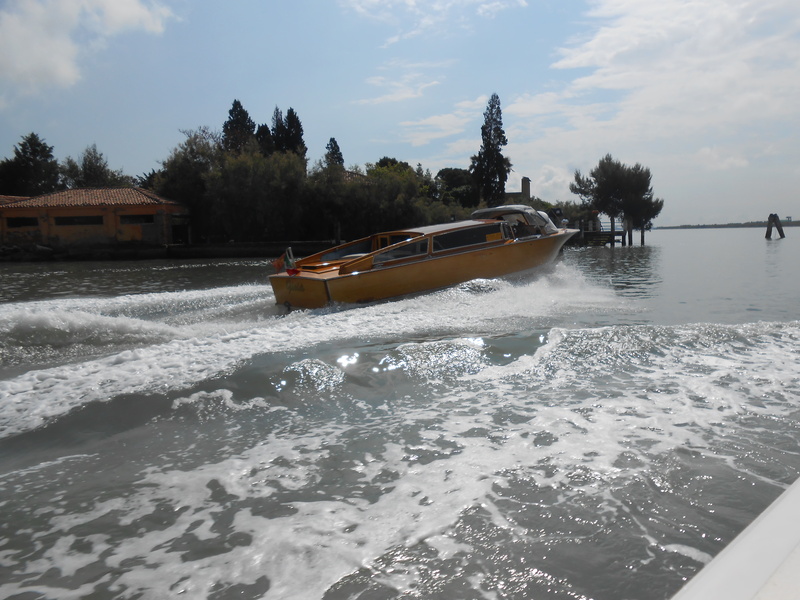 The most glamorous but most expensive way (110 euros = about $140 US) to get to San Marco Square or other water stops in Venice is to take a water taxi. The water taxis seem to rule the waterways, and our water bus slowed down to ride out the wake of the water taxis each time one raced by going in either direction. 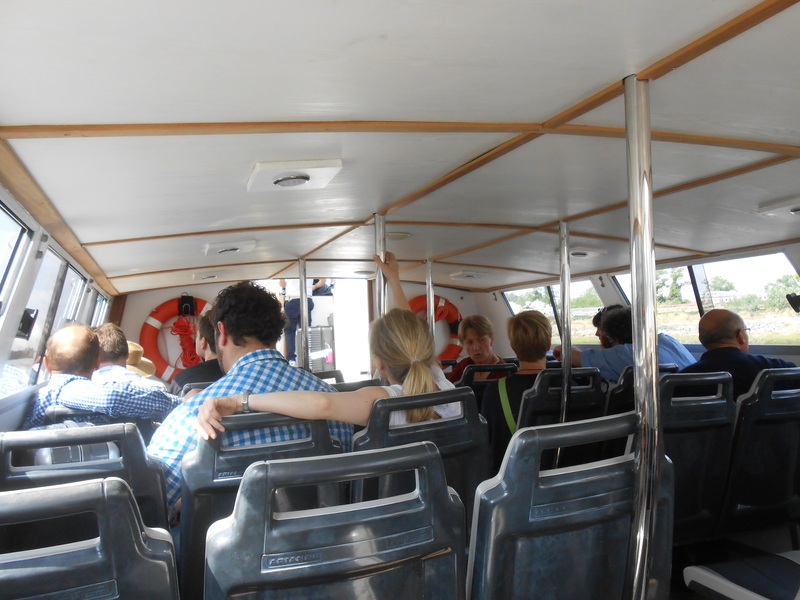 The water taxis did look like fun, but we liked the leisurely pace of our water bus. Our ride felt like a grand tour of the waterways with lots to see on the way. 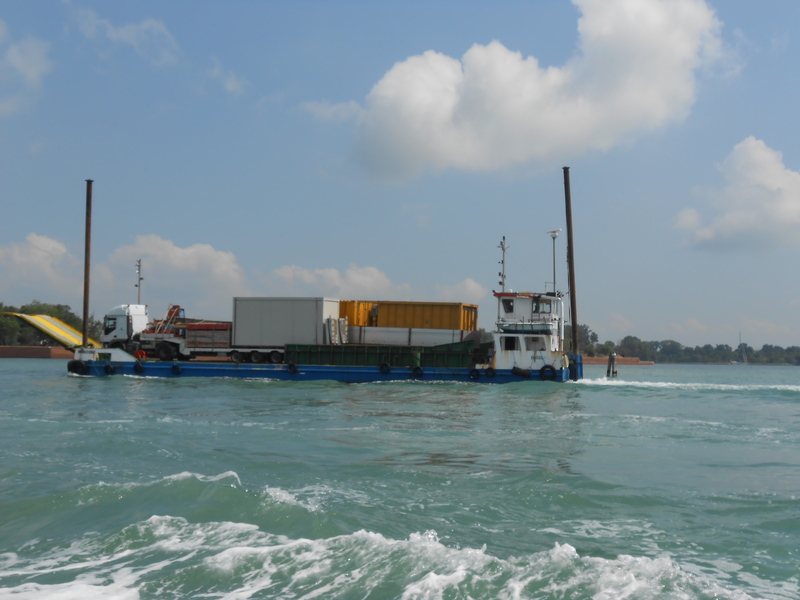 Along the way, we saw lots of interesting water traffic. 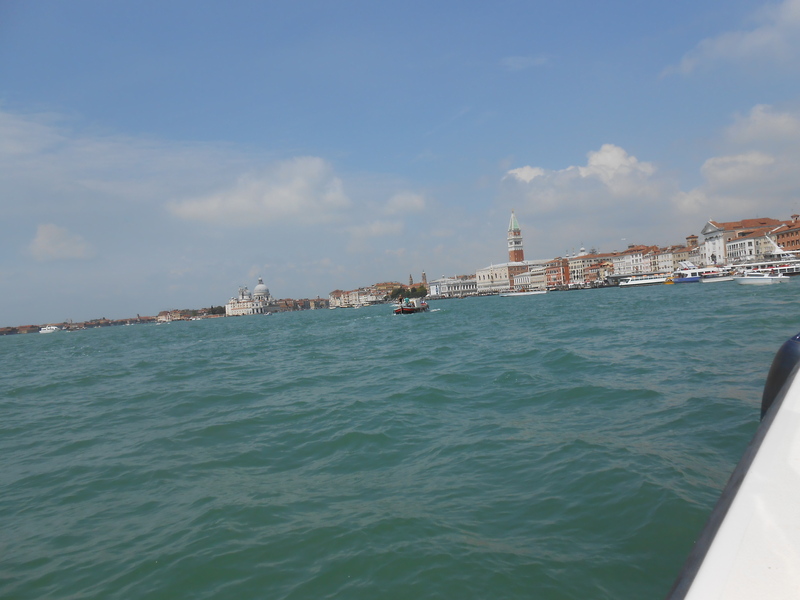 Our first view of Venice was breathtaking. Gondolas waited at the San Marco Square water bus station to take tourists out for a ride along the Grand Canal and other smaller canals. 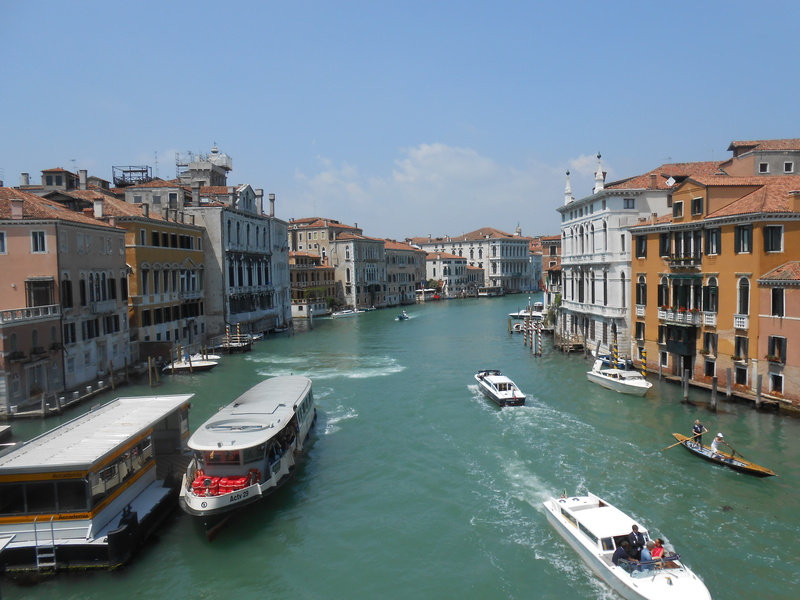 The Grand Canal hummed with steady traffic. Our hotel was just a few blocks (and two small bridges away) from the San Marco water stop. From this stop, we dragged our suitcases on wheels to our hotel. Alternately, we could have paid a porter to transport our luggage on a hand truck but being independent seemed like more fun. This next youtube video gives you an idea about how individual tourists get their bags to their hotel in Venice. Of course, if you go to Venice with a tour group and arrange for transfers, the tour managers will have your luggage waiting in your hotel room or your cruise ship room. And in this next video, Rick Steves gives an overview of his visit to Venice. 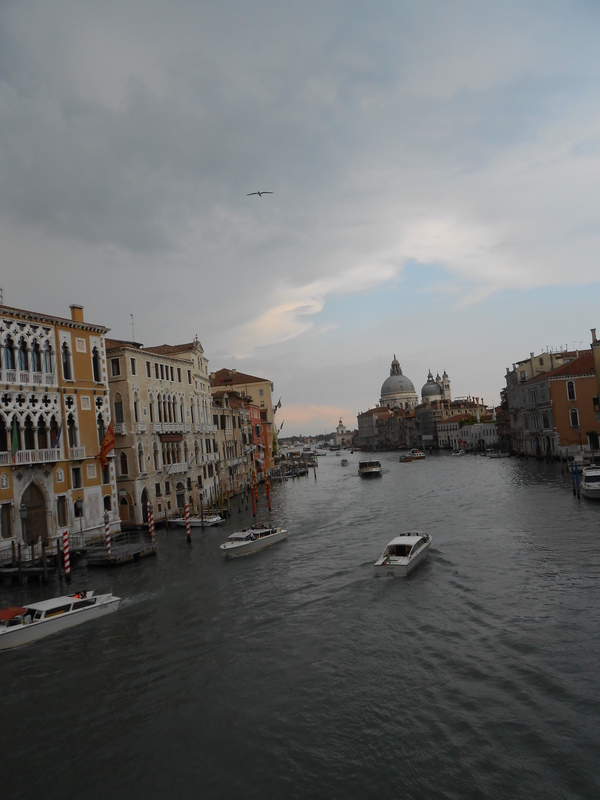 I will publish a few more posts on Venice in a few days.